I love Chinese food. 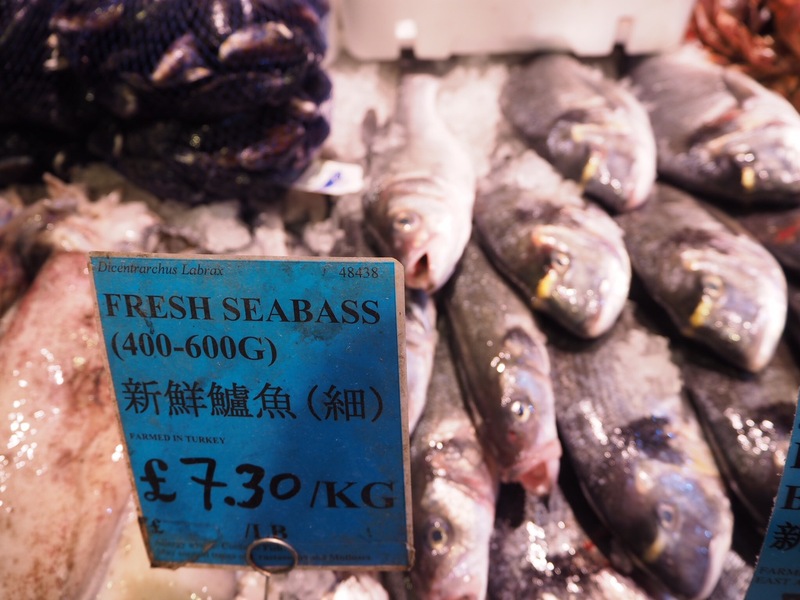 One of the first places I visited when I moved to London was Chinatown, and I simply drank in the sights, smells, and particularly the tastes of everything it has to offer. I’ve visited numerous time since then, and whilst the eateries are hit and miss, I love the cheap and cheerful Dan Dan Noodles at the Baozi Inn, roast duck at the Four Seasons, and shopping for ingredients at the supermarket, SeeWoo. Scroll down for the full recipes. In the past couple of months, I feel I’ve been cooking less, partly as I’ve been exploring so many restaurants in London, but also because work has been pretty busy, allowing me less time to find recipes and cook properly (beyond a simple salad). But then the August Bank Holiday rolled around, and just like every year, I forgot it was happening, so I didn’t make any plans. What a perfect time to embrace the stove once more! I headed down to SeeWoo after a dance class at Pineapple Studios on Saturday. It’s slightly overwhelming, as the aisles are narrow, the shop is packed, and the service leaves something to be desired, but the array of goods is utterly fascinating. From chicken feet to vegetarian meat floss, tinned jackfruit to dried mushrooms, it feels like Aladdin’s Cave! 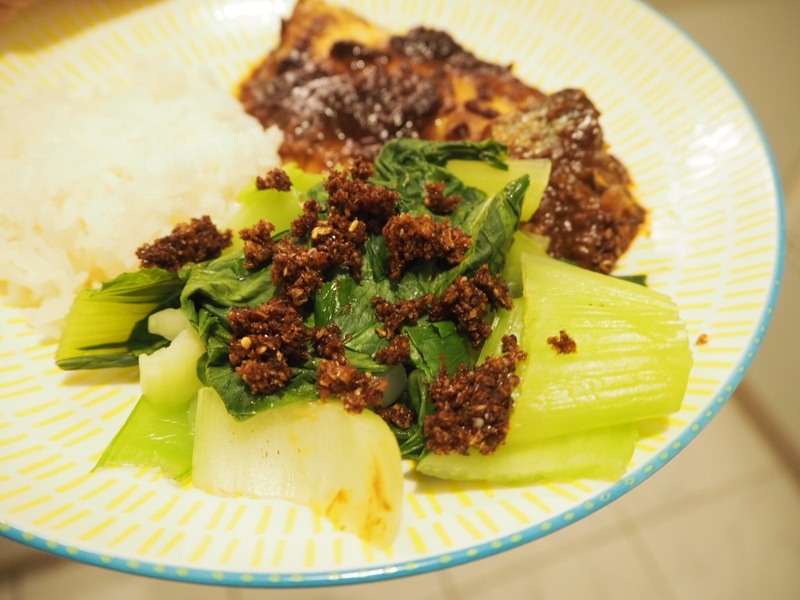 We had done our planning, so all we had to do was search and find the ingredients for miso seabass, chili and garlic prawns, and sesame bok choy. The fishmonger gutted and cleaned our sea bass for us (thankfully), so all we had to do at home was fillet it. The king prawns looked marvellous, and both fish were surprisingly cheap – we paid under £10 for 6 giant prawns and 2 whole sea bass! We then stocked up on everything else we needed, including a cute bamboo steaming basket (about £3) and some lovely patterned teacups (under £2 each). 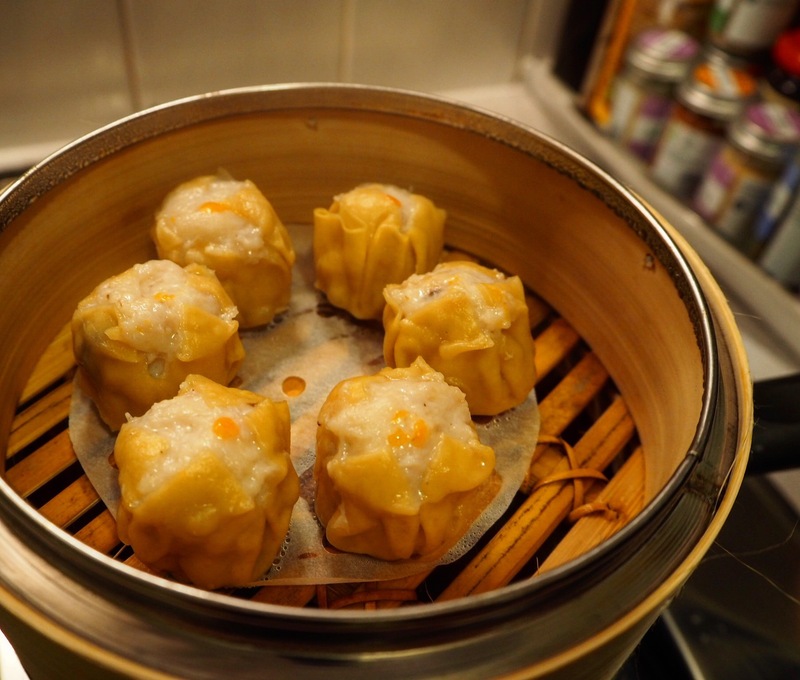 We also indulged in some frozen dim sum, which we steamed in our new basket, but couldn’t find any miso paste (the key ingredient for our main course!). Luckily, Whole Foods came to the rescue on that one. 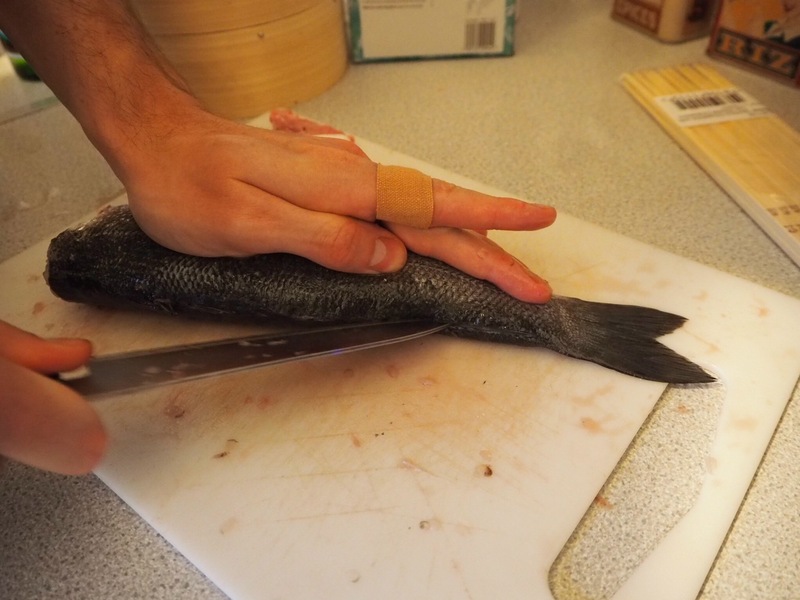 Filleting the sea bass took concentration, my newly gifted Japanese knife (thanks to my lovely sister), and a Jamie Oliver YouTube tutorial, but the satisfaction at the end was definitely worth it. 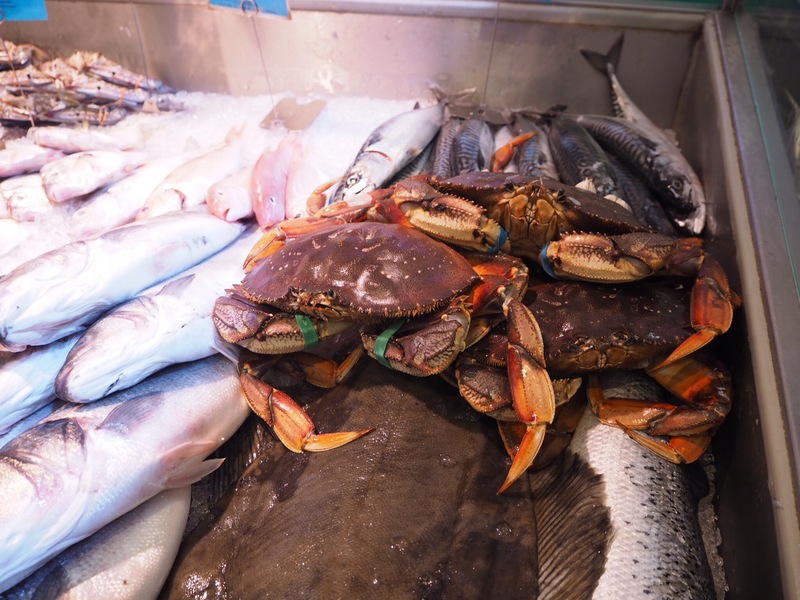 If you’re feeling adventurous, buy the whole fish rather than a fillet, and see what you can do! Mix all the marinade ingredients together in a bowl and add the fish, covering it in the goop. Cover the bowl and let it sit for at least an hour (more is always better). Pre-heat the oven to 180 degrees Celsius. 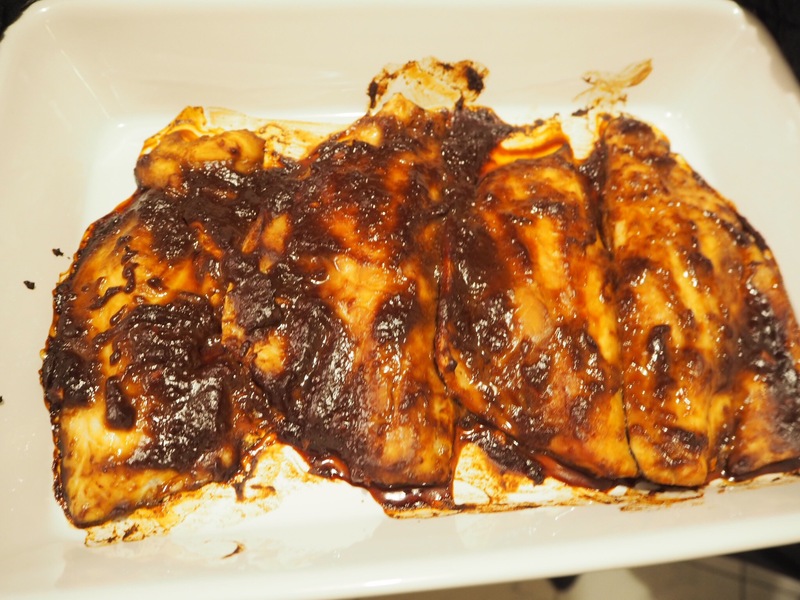 Place the fish on a deep baking tray and spoon all the marinade over it. Bake for around 10-12 minutes, and then 2-3 minutes on grill to char the top (unfortunately, we didn’t quite succeed in this). Serve immediately. It looks unappetizing. It tasted unbelievable. Gently roast the sesame seeds in a non-stick pan without oil, until they turn golden and emanate a wonderful smell (don’t let them burn). 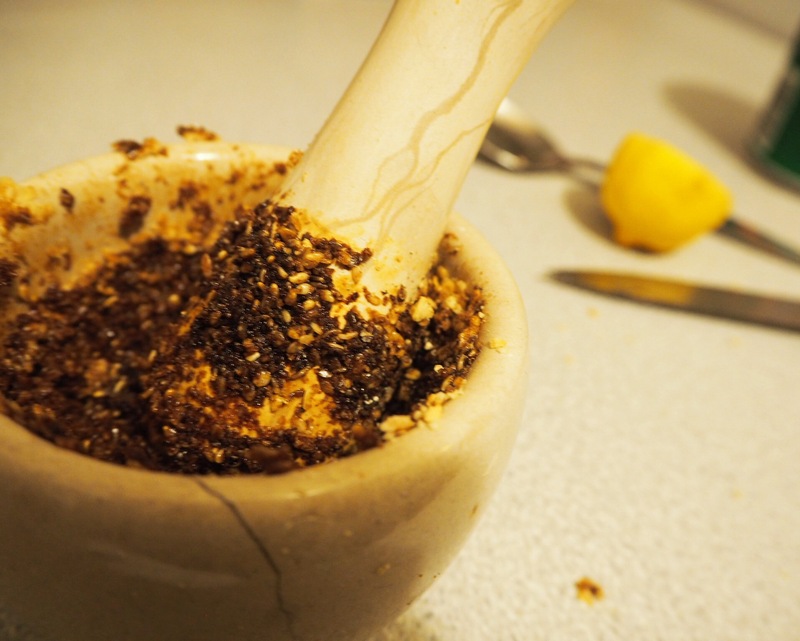 Tip into your mortar and pound until they form a coarse paste (a great way to work the biceps). Add the other ingredients and pound a little more. Serve with the paste spooned on top and a drizzle of sesame oil. 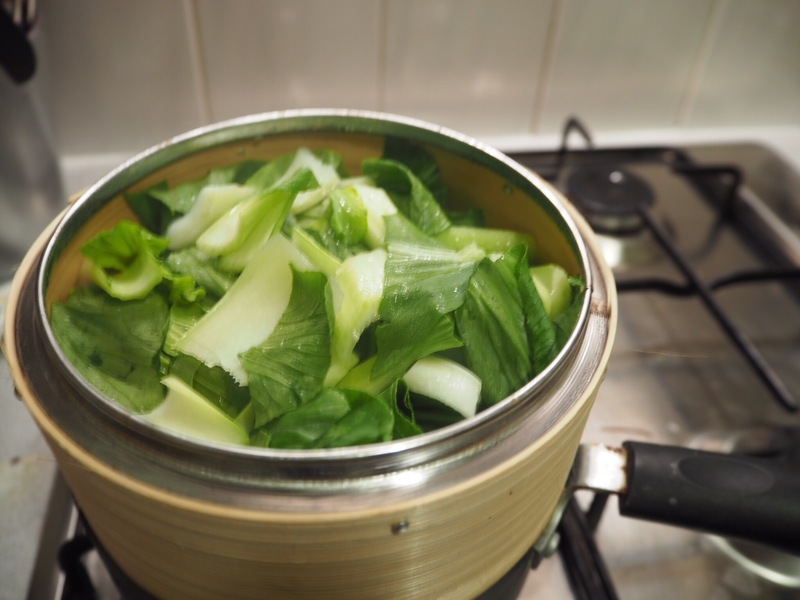 Serve the fish and bok choy with some steamed jasmine rice, or keep it no-carb, whichever you prefer. This meal goes well with some Tsingtao beer! I received a voucher from SeeWoo, but I paid for the excess and my opinions on their products are entirely my own. I love that steaming basket so much.